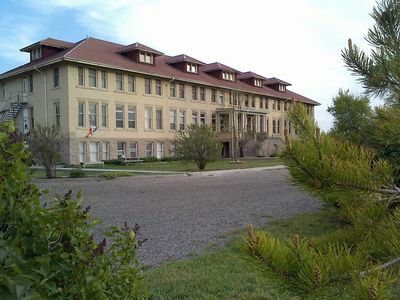 The Gooding University Inn, the old Gooding College building, is full of history and makes an excellent getaway for 1 person to large reunions. This is not a "cookie cutter" stay, the facility is unique and is full of charm. 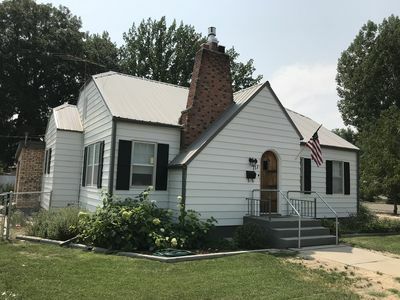 It was abandoned and neglected for many years and is now being remodeled and updated. There is a lot of work done, but it is "a work in progress", if you are looking for a Marriott like facility this is not it. The environment is open and rustic, with large hallways and rooms and some parts of the building needing finishing touches. We know you will enjoy making treasured memories with us. This beautiful historic building was the Gooding College, built in 1920. 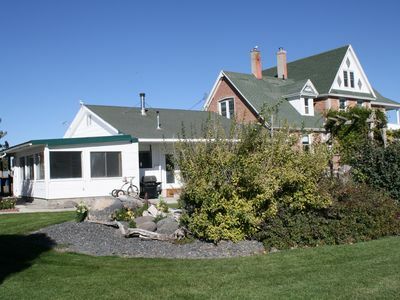 It has been restored/modernized and makes a wonderful getaway for family get-togethers and other events. The west has 15 bedrooms (each sleeps 2-8 people), 9 bathrooms, and a fully remodeled/modernized kitchen, dining room, game room and more . Currently we have beds for over 60 people, plus cribs and portable playpens. Also the Theater Room with High Definition Surround Sound and 3D movies, and a large play/gathering room (22'x75’) is included. Please take a look at the photos to see how beautiful this building is. In the sumer the east wing will be available for an additional fee. The east wing will add 9 bedrooms and 5 bathrooms to your space. If you need the extra space the east wing sleep 36 additional people in comfort. The additional cost to add the east wing to your rental is only $350/night. THE EAST WING IS ONLY AVAILABLE IF YOU ARE RENTING THE WEST WING. Enjoy going for a dip at the well maintained and convenient public pool. Cost is $3/person, three and under is free. Hours 1pm-5pm and 7pm-9pm The pool accompanies a park with playground equipment and space to run around. just 5 minutes away. Cliff jumping/Swimming/Large playing fields/Sightseeing. Open all year, hours are 7 a.m. to 10 p.m. 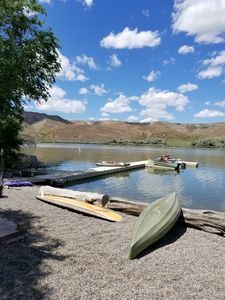 Cost is $3 per vehicle The swimming area has a beach blocked off perfect for younger children and for playing in the sand, lifeguards, kayak and paddle board rentals, picnic areas with shelters, restrooms, playgrounds, swings and fishing available. In addition you can purchase refreshments. There are trails to walk too. The lake is surrounded by reeds and rocky cliffs. Beautiful setting. The amazing Shoshone Falls in also included is the price. Shoshone Falls and Dierkes Lake are a must do for any group. Truly an amazing authentic mexican treat. Try the Molcajete you won't be disappointed, guaranteed, only $15 and feeds 2 if you're hungry. 5 min away. Elegant dining at an affordable price. This is our favorite date night restaurant. We highly recommend the Bacon Spezie $13 and the Italian Nachos (full) $8.50 We buy both and split them. 35 minutes away. 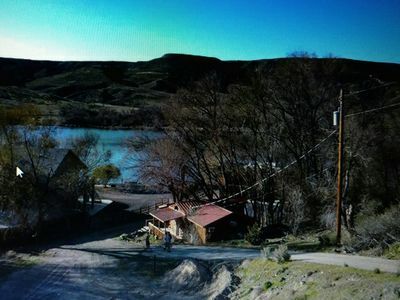 The River Cabin - Hagerman, Idaho - Picture Postcard Beautiful! 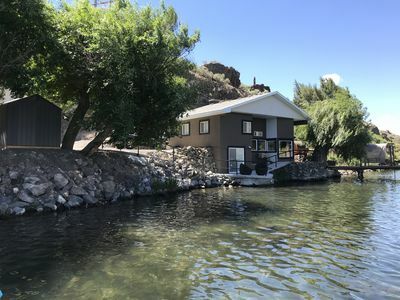 SNAKE RIVER GET AWAY- Right on the RIVER! 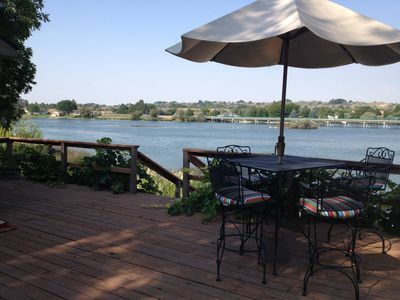 Amazing relaxing get-away home on the Snake River with river view and boat dock. 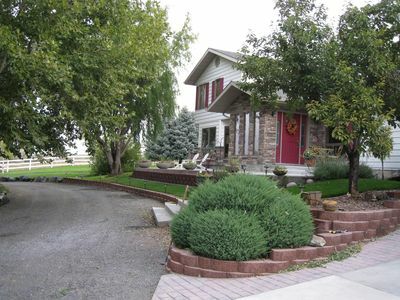 It is a beautiful private place on Snake River Front. 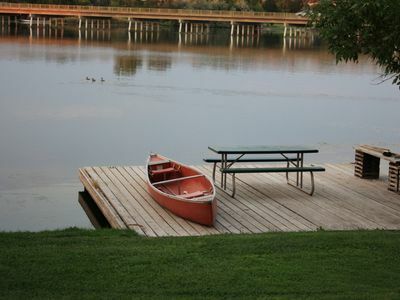 USE FREE CANOE TO ENJOY.